If you love being outdoors, you’ve got to check out Zillertal. Located in Tirol, Austria, the valley is surrounded by the Tux Alps to the west and the Kitzbühel Alps to the east. It’s an adventure lovers paradise. I really enjoyed my time in Zillertal. It offers adventures for everyone of varying difficulties. This photo of the Hintertux Glacier is from September. It’s always ski season at the Hintertux Glacier. It’s the only spot in all of Austria that you can ski 365 days a year -even in summer. I’m excited to ski in September. Besides the fact that it’s just cool to ski in summer, the advantage is that you have the slopes to yourself. Most people aren’t as cool as you are to ski in summer or fall. It’s you, a few die-hards who love mountain adventures and professional ski teams practising. I loved seeing that one of the ski teams was one from Nakiska, in the Canadian Rockies, near where I used to live. Professional ski teams from around the world (including Canada) train here. I went in September. The snow was surprisingly good. According to the snow report, there had been approximately 45 cm of new snow in one week. Me contemplating that after a morning of skiing, I can now go hiking! Zillertal is a hiker’s paradise. You’ll find a whopping 1400 km of hiking trails here in the Austrian Alps. Check out the contrast of snow with the lush green valley. 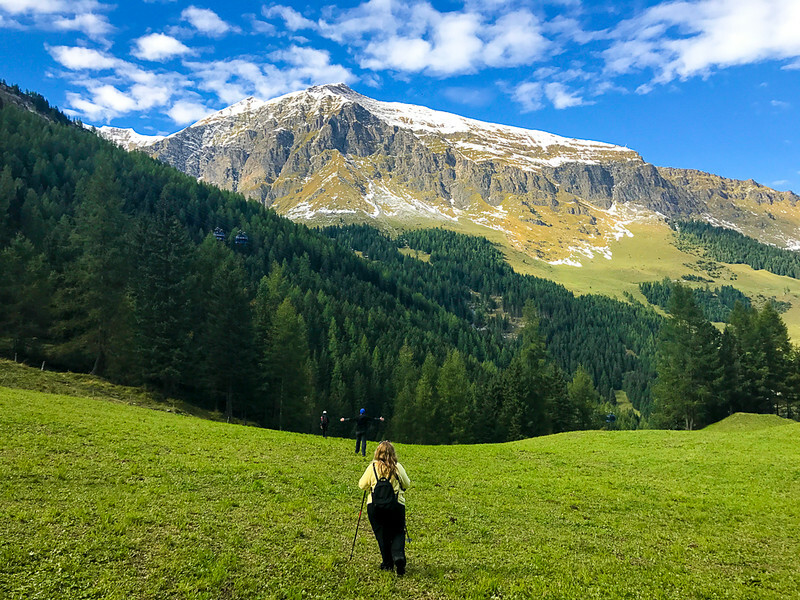 One of the things that I loved about hiking here in fall (my favourite season) is that you get an incredible contrast of snow-capped peaks with lush green valleys. It’s stunning. Hiking down from Hintertux Glacier. 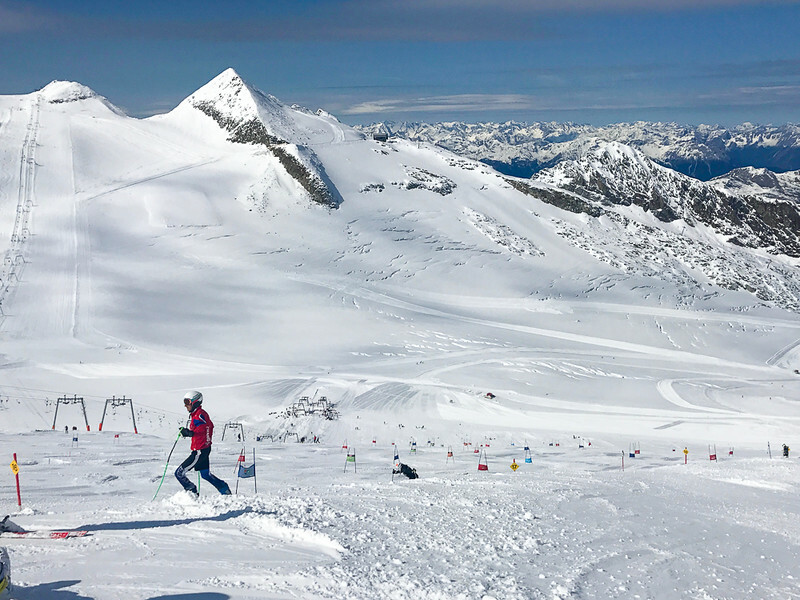 Another cool thing you can do for an epic adventure is to ski the Hintertux Glacier in the morning, then hike down in the afternoon. That’s what we did. Janicke from Let’s Get Lost enjoying the views over the valley and the Alps. You’ll also want to be on the lookout for Alpine marmots. Marmots are large prairie dogs that live in burrows. You’ll find them both in meadows or close to rock piles throughout the Alps. They hibernate in winter. You’ll usually hear their high chirps before you see them. Be on the lookout for marmots. Can you spot him? You’ll usually hear them before you see them. If you hear them, it’s likely an alarm call to warn other Alpine marmots that a predator – that would be you, is in the area. Foxes and raptors also prey on them. And in the Canadian Rockies bears and coyotes eat them as well. Can you spot the one below? They blend in really well. Helene from Helene in Between hiking down from the Hintertux Glacier. Me exploring some of the 1200 km of bike trails found in Zillertal. In addition to the 1400 km of hiking trails, you’ll also find 1200 km of cycling trails in Zillertal.These range from easy hikes in the valley along the river to more challenging mountain biking. I choose the more relaxed cycling in the valley. Many lifts run in the summer so you can take a lift up and the cycle down. I love this option as I hate cycling uphill. I’m a total wuss when it comes to doing hills on a bike. You can hike or bike and ski in winter in the Zillertal Arena. Zillertal is excellent for families too. You can hike or take the lift up from Zell am Ziller. Then enjoy the views while sampling a Zillertal Bier. Children will love playing in the nearby Spruce Tree Castle. Then you can either hike or cycle down. 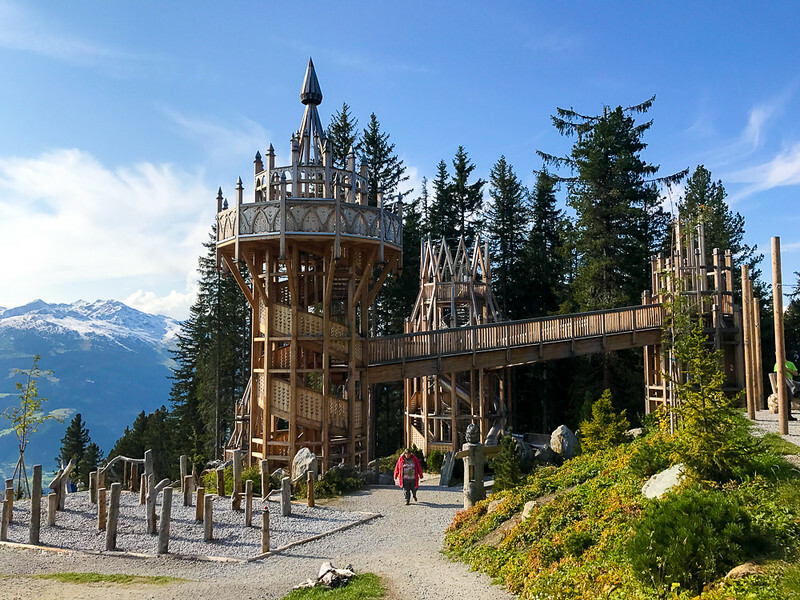 Children will love the Spruce Tree Castle play area at the Rosenalm at Zell am Ziller. Me doing the fabulous High Ropes Course in Mayrhofen. Have you done a high ropes course? I admittedly hadn’t until I moved to Germany. They’re starting to pop up in North America. I did a great one near Las Vegas. They’re a series of obstacles high in the trees where each obstacle is different. They require good balance and problem solving as you shakily make your way along a narrow rope like a tightrope walker. I love these so much because my first thought is always, there’s no way that I can do that. But someone, one shaky step at a time, I do. The confidence that I gain on a high ropes course stays with me long after I’ve finished. I did the oneMayrhofenofen with Mountain Sports which I highly recommend. They also offer a flying fox (zip line course). The High Ropes Course in Mayrhofen is a great way to challenge yourself. 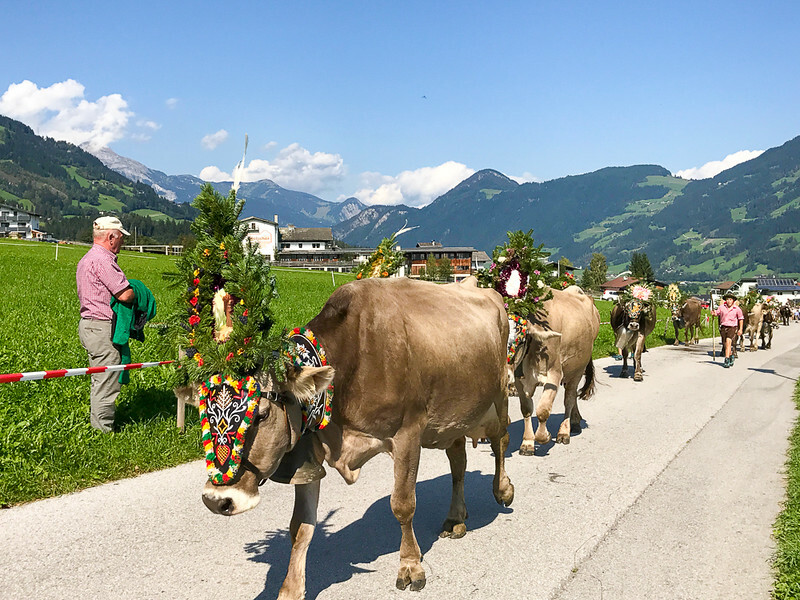 The Almabtrieb is an annual event celebrating the cows safely returning from the mountains. You may have heard the expression, till the cows come home. In the Almbetrieb they literally come home. Each year in the Austrian Alps, 500,000 cattle are herded down from the Alps to the lower valleys where they’ll spend the winter. The tradition also happens in the German and Swiss Alps, but with fewer cattle. The cows wear bright coloured floral headpieces. They look good. And they seem to know it. These cows have an attitude. But who can blame them when they look so pretty? Locals wear traditional clothing during the cattle drive. The Almbetrieb is usually held near the end of September, depending on the weather. It takes place over a couple of weekends depending on the town. Check with the tourism board for exact dates each year. It’s worth planning your visit around the Almbetrieb. 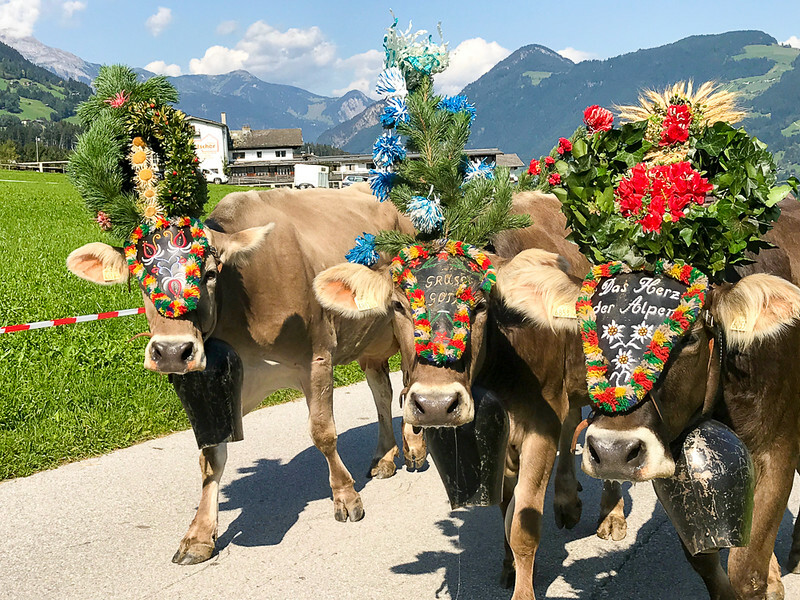 The cows are dressed with flowers to celebrate their safe return from the mountains. Almabtriebs are a must-see event. The Almabtrieb has a long tradition that children learn from a very young age. Things I thought I’d never say “This cow is better dressed than I am.” Wonder if she has any fashion tips? If you’ve never been to a sauna in Germany or Austria before, you need to read this. Spoiler alert: You have to go naked. It’s not optional. You can, however, cover up with a towel. I went with an international group. None, including myself, who were overly comfortable of the idea of seeing each other naked. Much to the Austrian’s chagrin, they believe it’s just nature. This adventure may have pushed us out of our comfort zones more than any other. Ladies, you may also want to check out my Shy Girl’s Guide to the Naked Sauna. I’m fortunate that it’s only ~ 140 km from Munich where I live so really easy to get to. It’s a place that I’ll keep coming back to. Afterall, I’ve only explored about 10 km of the 1400 km of hiking trails. My trip to Zillertal was made possible through the Social Travel Summit and Zillertal Tourism. As always, all opinions are my own. Hey Laurel, great post! Love the pictures of the Alps. What an amazing place! I love skiing and would love to create a tour with skiing included in the Alps. Great stuff!